The Xbox 360® is just one of the many gaming consoles available in the market today. It can connect to the router wired or wirelessly for seamless gaming. Power OFF the Xbox 360 and connect an Ethernet cable from any of the numbered ports at the back panel of the router. Then, plug the other end of the cable into the Xbox 360’s Ethernet port. NOTE: If you have a second Xbox 360 unit, connect it to the router by running a cable between the devices in the same way as how the first unit was setup. QUICK TIP: Playing with two (2) Xbox 360 units simultaneously on the same network may cause slow and unstable connection due to the bandwidth that playing online video games require. Moreover, simultaneously playing two (2) Xbox 360 units on the same network connected to the same server (i.e. the same online game) is not allowed since the modem will only generate one (1) IP Address. Power ON your Xbox 360 and configure the IP Address Settings. For more information on how to configure the IP Address Settings on your Xbox 360, click here. NOTE: The Domain Name Server (DNS) is the IP Address of your Internet Service Provider’s (ISP) server, which translates the names of websites into IP Addresses. NOTE: If you have more than one Xbox 360 unit, configure the IP Address by adding one (1) on the last part for each unit. For example, an Xbox 360 unit is assigned an IP Address of 192.168.1.30. Therefore, the second Xbox 360 unit should be assigned the IP Address of 192.168.1.31, and so on. The other values should be copied as they are. NOTE: Before proceeding, take note that Linksys DOES NOT support the configuration of your Xbox 360. The instructions below are a guide on how to configure the router for the Xbox 360 console to connect to the Internet. Before you begin, make sure that your Internet connection is active and stable. An Open NAT connection is a requirement for your Xbox 360 to have seamless network connection to the Internet or other Xbox 360 game consoles in your network. This can be confirmed by first verifying the NAT capability of your Internet modem. Access the router’s web-based setup page by opening a web browser such as Internet Explorer® or Safari®. In the Address bar, enter your router’s local IP Address then press [Enter]. When the login prompt appears, enter your router’s User name and Password. NOTE: The default local IP Address of Linksys routers is 192.168.1.1. For detailed instructions on how to check the IP Address of your router, click here. NOTE: If the Internet IP Address on your Linksys router is private while it is connected to the modem, then the modem has NAT capability. This will block the Xbox 360’s connection to the Internet. You should contact your Internet Service Provider (ISP) and ask them to disable the NAT capability of your modem. If the Internet IP Address of the router is public, then the modem does not have NAT capability. NOTE: 192.168.*. * is an example of a private IP Address, where * is usually a value between 0 and 255. 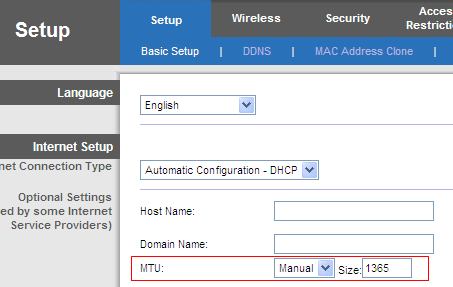 Access the router's web-based setup page and on the Basic Setup tab, under Internet Setup, adjust the MTU size to 1365. NOTE: The recommended MTU size for Xbox 360 is 1365. QUICK TIP: For specific online games, you need to verify the required ports first to be able to have the correct ports for port forwarding. This is because different games require different ports for forwarding. To get the complete list of ports to be forwarded for Xbox 360, contact your device manufacturer. On the web-based setup page, click the Applications & Gaming > Port Range Forwarding. Under the Application Name, enter "XBOX1" or any name you want to represent the ports being forwarded, then enter the required ports to be forwarded under Start ~ End Port. Also, choose the appropriate Protocol, then enter your Xbox 360’s IP Address. NOTE: Port Forwarding the same ports for two (2) Xbox 360 units is not allowed. If you want to connect two (2) Xbox 360, you need to contact your ISP to purchase another WAN IP Address. Check the Enabled box after the IP Address value and click . NOTE: After saving, you might want to check if the settings have been properly saved. To do this, click on the Port Range Forwarding sub-tab under Applications and Gaming. If the settings have not been saved, do a router firmware upgrade. This will update the firmware on your router which will fix bug issues and possible errors. For instructions on how to upgrade your router’s firmware to the latest version, click here. After the upgrade, perform the configuration steps for your Xbox 360 again. You should now have successfully set up your Xbox 360 behind your Linksys router. NOTE: If you have already set up your Xbox 360 and you want to connect it wirelessly, you need to have the security settings of your Linksys router. To know how to get this, click here. If you’re trying to connect using a Linksys Wireless-N router with Linksys Connect, click here.